Situated atop eastern Wisconsin’s highest hill in Hubertus, Holy Hill, National Shrine of Mary, Help of Christians draws hundreds of thousands of pilgrims from all over the U.S. each year. 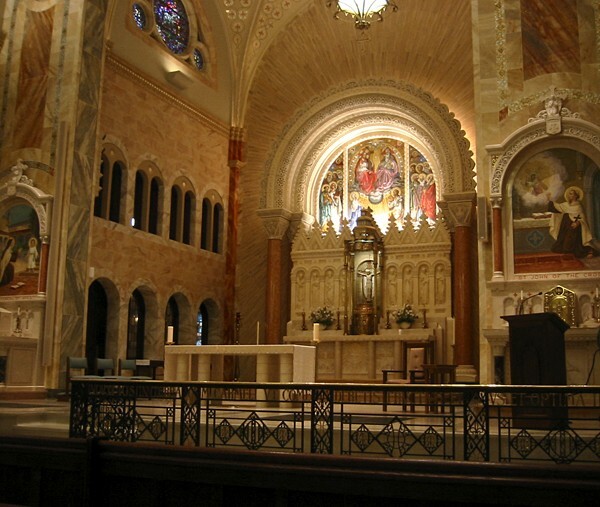 Many stories of miraculous cures have been reported from Holy Hill, where a wall of abandoned crutches and wheelchairs stands as a testament. The hill has been considered holy ground since the first settlers arrived in the area and the first log chapel was dedicated. 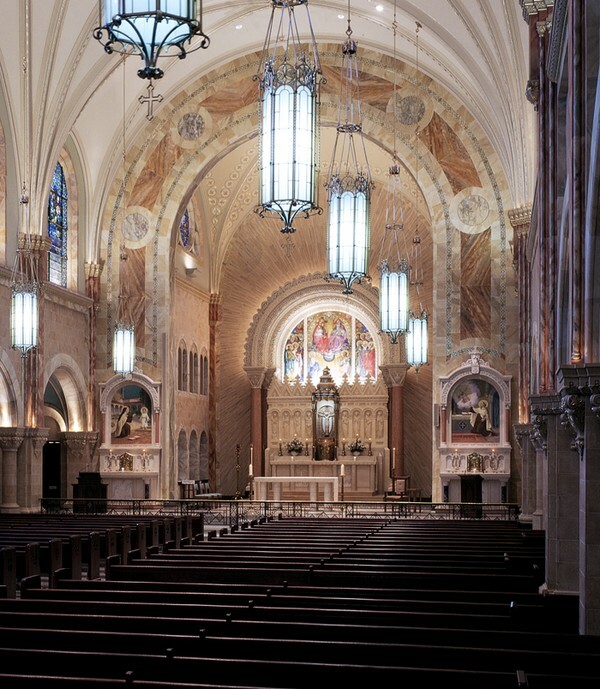 One church followed another, and the third, most prominent of the Shrines was built in 1926. 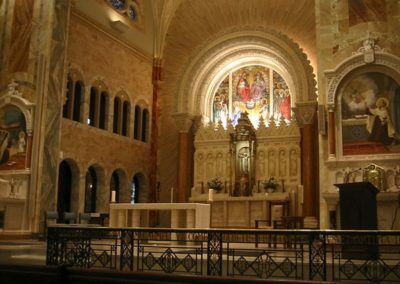 Holy Hill, whose caretakers are the Discalced Carmelites, has become an icon for the surrounding community. 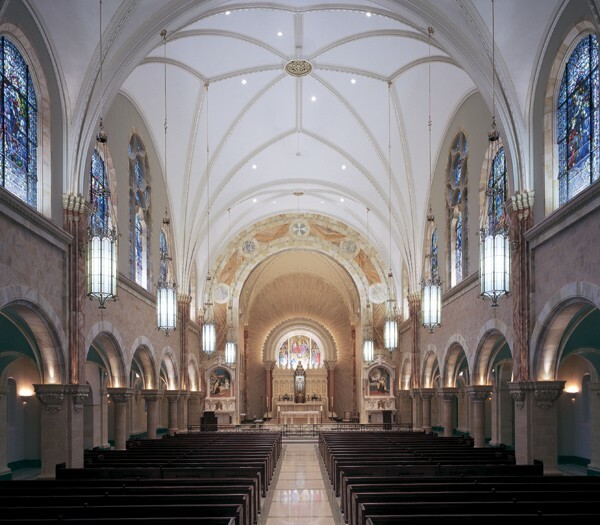 Conrad Schmitt Studios has been privileged to have a long relationship with Holy Hill. 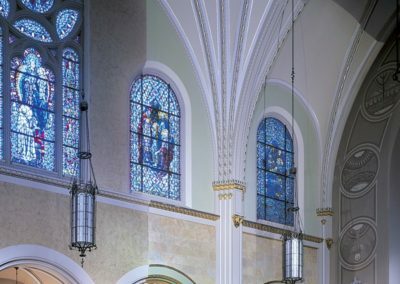 Many of the stained glass windows in the Shrine were designed and fabricated by Frank Larscheid, who was employed by Conrad Schmitt Studios in the 1920s and 1930s. 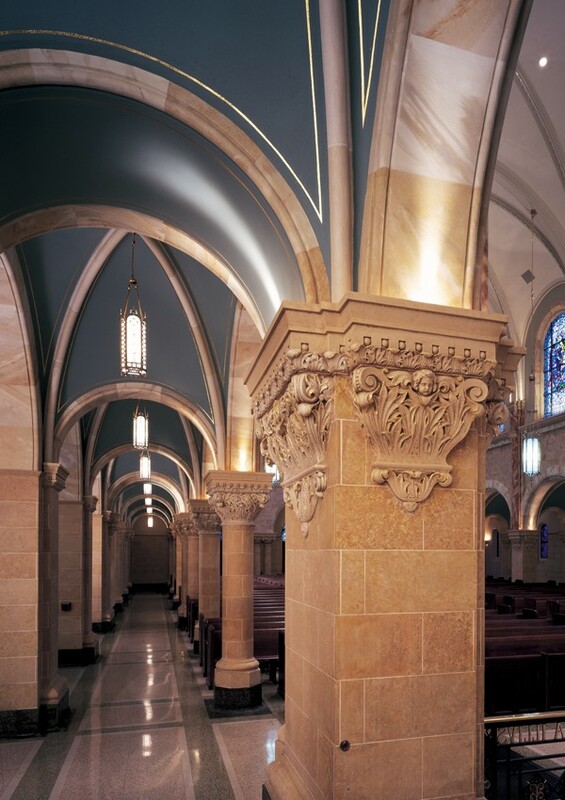 He designed the altars and the carved pew ends as well. 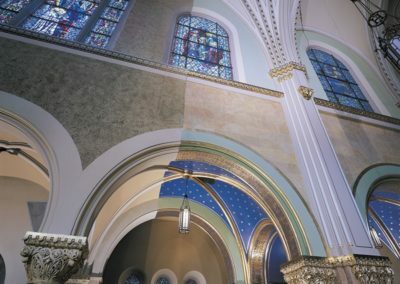 Bernard O. Gruenke, Sr. led the 1950s decorative painting at Holy Hill. 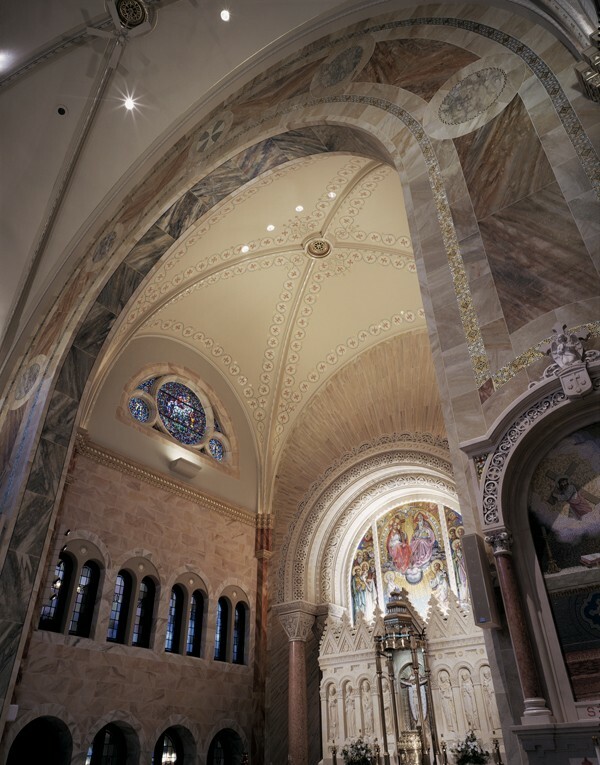 The design team for the reredos and mosaics included German professor Peter Recker, who was brought to the U.S. by Bernard O. Grue­nke and employed by CSS. The German artist previously had worked at the Vatican, restoring historic mosaics. 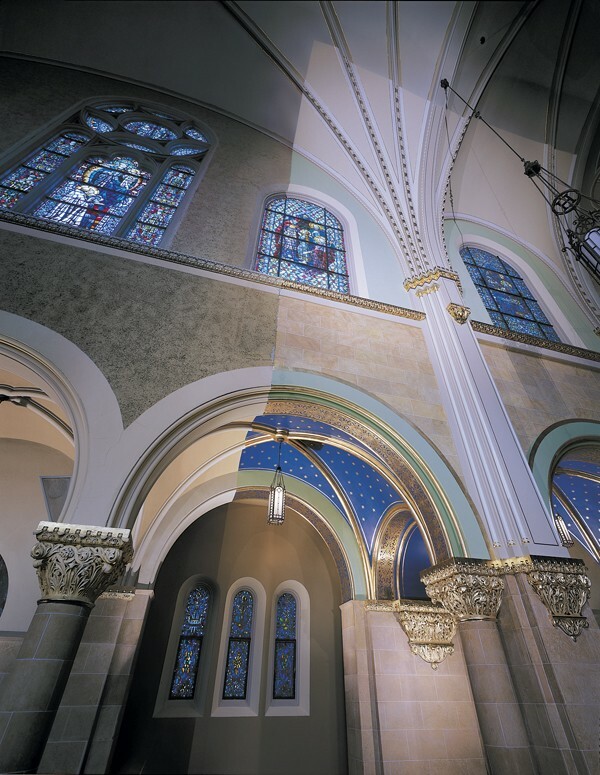 Some decades later, Bernard O. Gruenke composed the proscenium arch’s angels and the Days of Creation designs. 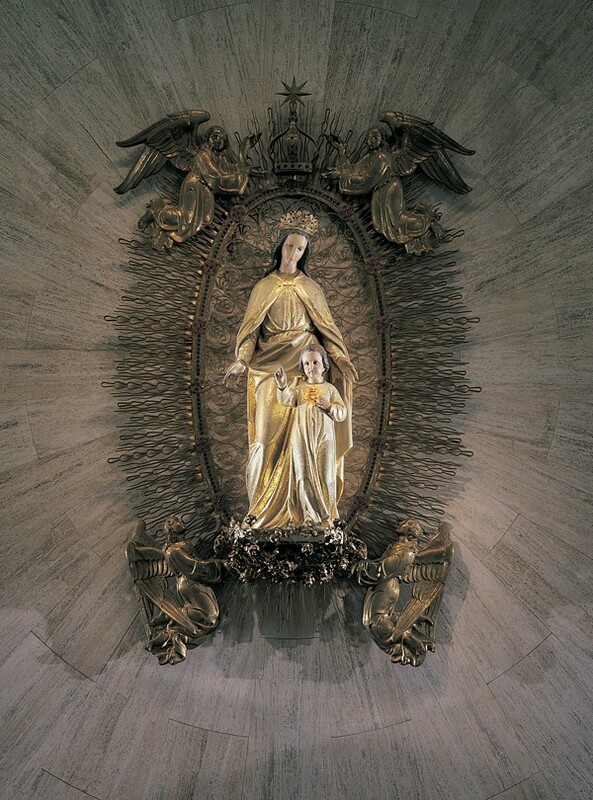 More recently, Studio artists have painstakingly restored the Marian Shrine statue and, for the recent restoration and renovation, created a sample area of the proposed new decoration to assist in fundraising. 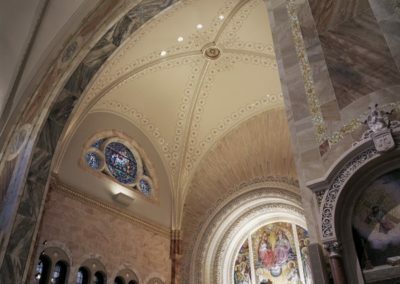 The renewal of the classical Catholic worship space addressed every surface, with plaster restoration, a new decorative paint scheme, marble and mosaic cleaning, restoration of the terrazzo floor and refurbishing of the pendant fixtures. 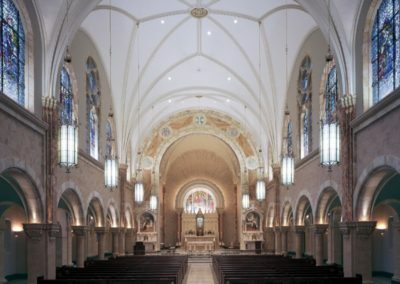 The intent was to restore water-damaged areas and provide a renewed and inspiring decorative scheme without sacrificing the original, traditional elements. 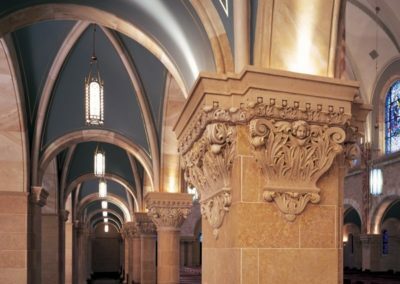 CSS provided a new palette and design artistry largely comprised of faux stone painting to enhance the Romanesque interior architecture. 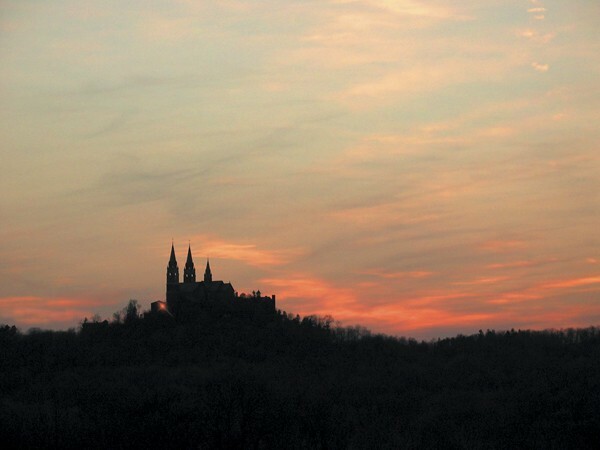 Holy Hill was declared a Shrine with “Portiuncula privilege” by Pope Leo XIII in 1903. 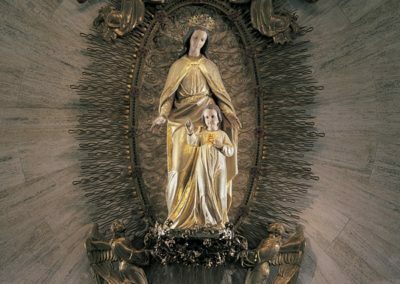 And, as a result of the increasing number of pilgrims, the Discalced Carmelites of Bavaria were invited to staff the Shrine in 1906. 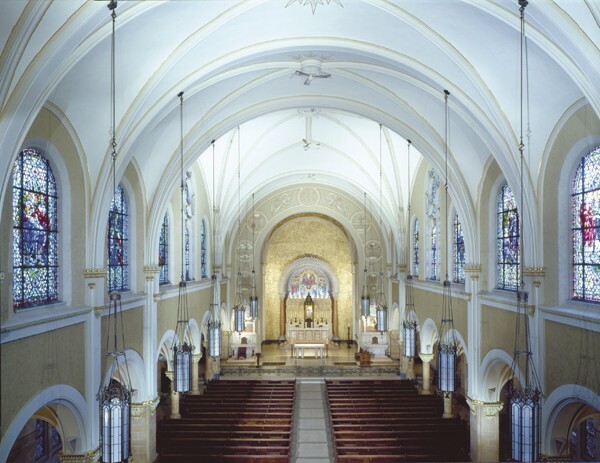 On November 19, 2006, this Wisconsin Shrine was elevated to the status of Basilica. 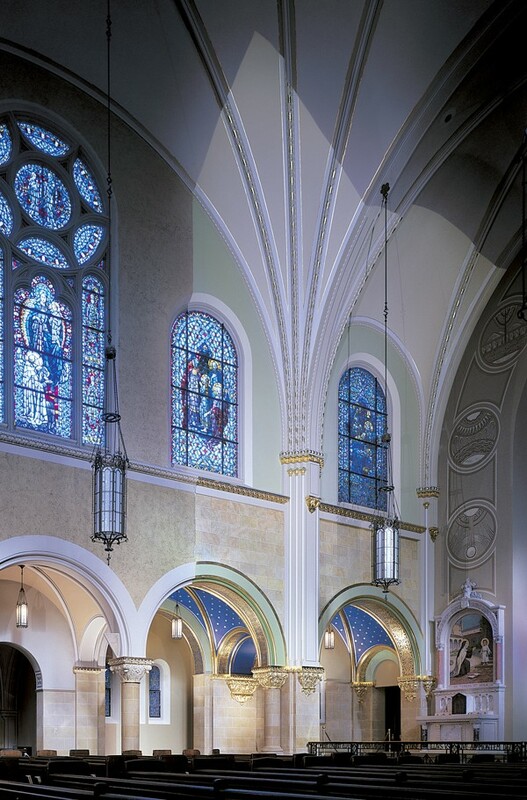 In 2014, Conrad Schmitt Studios was part of a team that designed and fabricated a display case to house a special gift from His Eminence Timothy Cardinal Dolan to the Basilica of Holy Hill. 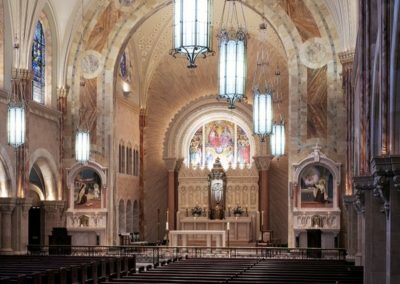 Cardinal Dolan was the former Archbishop of Milwaukee and frequently returns to the area to celebrate the Eucharist and speak to the Catholic community. 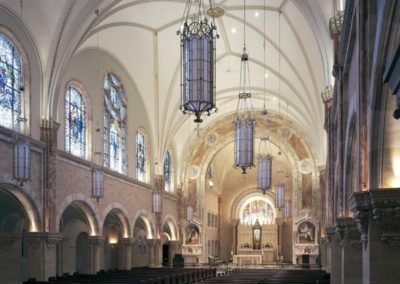 Last year, His Eminence presented the Basilica with the pallium that he received from St. 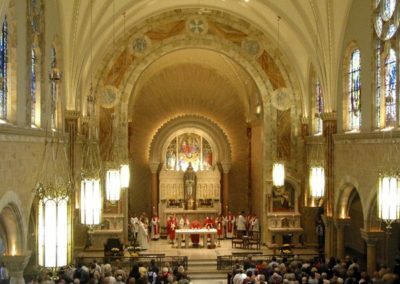 Pop John Paul II upon his appointment as the archbishop of Milwaukee in 2003. A pallium is an ecclesiastical vestment bestowed by the pope upon archbishops. This circular band of white wool is worn around the shoulders and features two pendants. The pendants are weighted with small pieces of lead covered in black silk. The pallium symbolizes the dual responsibilities entrusted to each metropolitan archbishop: Shepherding the flock and fostering communion with the Vicar of Christ. The pope is the only other member of the clergy to wear a version of the pallium. Having worked with the Basilica many times throughout the years, the Carmelite Friars asked CSS to assist with the design of the special case. The display also includes a description of the significance of the vestment, a photo of St. Pope John Paul II bestowing the pallium upon Cardinal Dolan and a timeline of the Cardinal’s life in the priesthood. 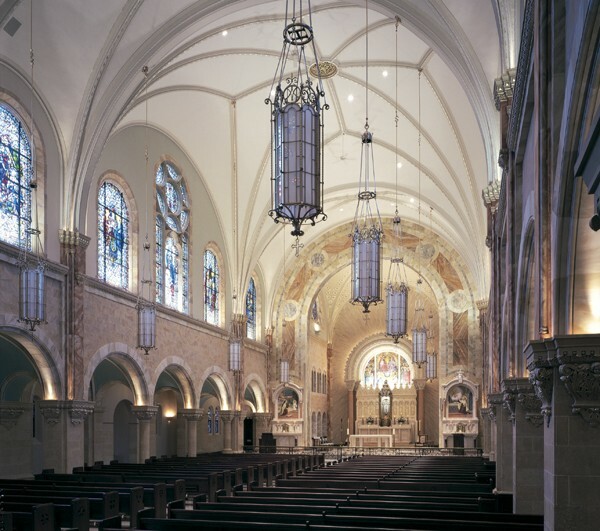 The case is constructed of red rift oak and stained to match the existing wood in the Basilica. Similarly, the metal base of the stand replicates the detailed fleur-de-lis design of the cast iron communion rail. Together, these components help incorporate the display case into the architecture of the space and provide a worthy home for this precious gift.